The Fall 2014 edition of <i>Electronic Beats Magazine</i> is out now! This October marks the 25th anniversary of the fall of the Berlin Wall. Its demolition not only ushered in German re-unification and the end of European communism, but also stimulated a musical explosion in Berlin’s burgeoning techno scene, where pounding rhythms became the soundtrack to a future full that was wide open. The city’s well-established squat culture contributed significantly to the formation of Berlin techno by providing cost-free and ungoverned spaces to throw parties. In this issue of Electronic Beats Magazine, editor-in-chief Max Dax and Robert Defcon interview the squatters, musicians and club owners of the late 80s and early 90s to find out more about the relationship between anarchist politics and electronic music. 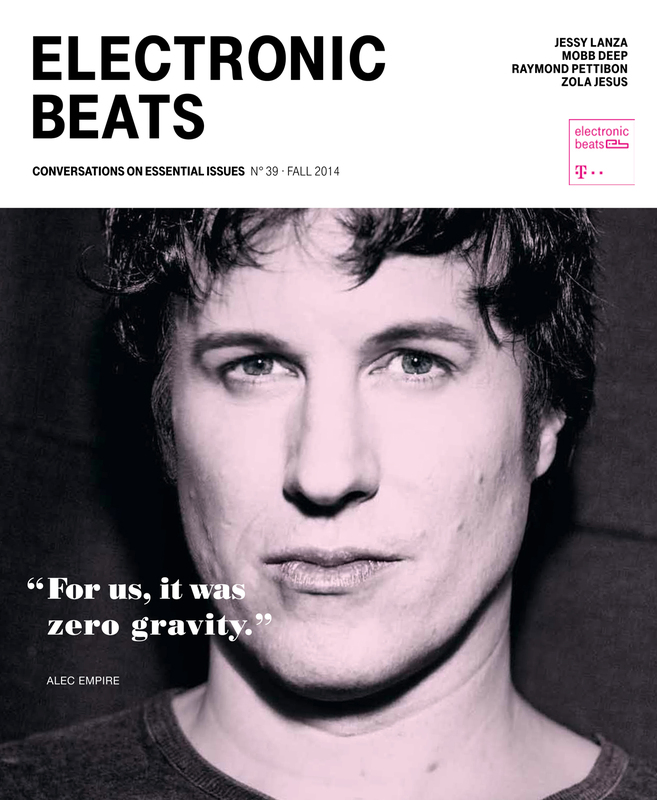 And who better to anchor the conversation than Alec Empire, who also graces the issue’s cover. Of course, it’s impossible to delve into the development of Berlin techno without talking about the influence of Detroit. That’s why we also made our way over to the Motor City to talk to talk to Mad Mike, Mike Huckaby, Cornelius Harris, and other seminal Detroiters to find out about the evolution of the city’s various strands of groove, as well as the implications of its impending gentrification. — M.E.S.H. waxes philosophical on the code-heavy sound of TCF. — A.J. Samuels meets hip-hop’s perennial phoenixes, Mobb Deep. — Lisa Blanning moderates a conversation between Ben Frost and artist Richard Mosse about their collaboration in the Democratic Republic of Congo. — Tin Man writes a speculative biography of Roman Flügel’s Happiness Is Happening. — Max Dax interviews the ever-political Raymond Pettibon. — Tim Lawrence tells the history of The Lucky Cloud Sound System and how David Mancuso modeled the original Loft party on the arc of an LSD trip. — Jessy Lanza explains how John Carpenter’s horror movies soundtracked her childhood. — Dylan Carson talks about why The Bug’s Angels and Devils loops so convincingly. — Stefan Goldmann discusses the importance of pre-sets and how they’ve shaped so much of the music we listen to today, electronic and otherwise. — Jackmaster’s Britpop past exposed! And, of course, always and forever, many more enthralling stories.